These Tasting Panel Awards include Best Dark Chocolate, Best Truffle, Best Artisan, Best New Product, and more, including three new categories for Best White Chocolate and Attendees Choice Awards. Thank you to the judges, exhibitors, volunteers, panelists, and celebrity guests such as Chef Tanya Holland for making this a successful day. 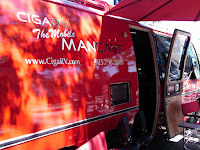 For those times when a man just feels like a good smoke, some whiskey, and someone else to drive, comes the CigaRV.com. This is literally a luxury RV decked out with all the accoutrements of a cigar lounge. First Round Voting begins in September 2012. Nominees will be announced in November 2012. The biggest change this year is that instead of announcing the Winners at the January red carpet event in Hollywood, they will be announced them via livestream in December. The red carpet event in Hollywood in January 2013 will now be a celebration of the winners, honorees, and nominees. The lovely TasteTV Host Susan Jones sporting a classic blue evening dress at the recent Jean Paul Gaultier Exhibition Gala at the DeYoung Museum in San Francisco. The exhibition profiles the avant garde French designers' work over several decades, including his masterpiece costumes for Madonna.